Rice pudding has been made in Britain ever since rice found its way there via those Asian European trade routes in the eleventh century. It’s a classic pudding and one of my very favourites, even eaten from a tin. In the Victorian times, it would have been put into the category of ‘nursery puddings’ along with all the other milky, custardy unrefined ones that everyone remembers from their childhood. I love all of the milk puddings: semolina, macaroni, sago, the lot, but rice pudding is the best. I served it at one of my Pud Clubs, but it unfortunately scored low; it seems that people either love it or hate it. Nye ye ris whges hem clene, seethe them fort til hit breke, let it kele, do thereto almand mylke, and of Kyne colour yt salt, and gif it forth. Roughly translated: rinse the rice and boil it until it will break easily. Let it cool, and add almond milk as well as cows’ milk (kyne). Add some salt and serve. I think that a combination of almond and cows’ milk sounds quite delicious. Notice that there’s no sugar or spice; far too expensive in those days! 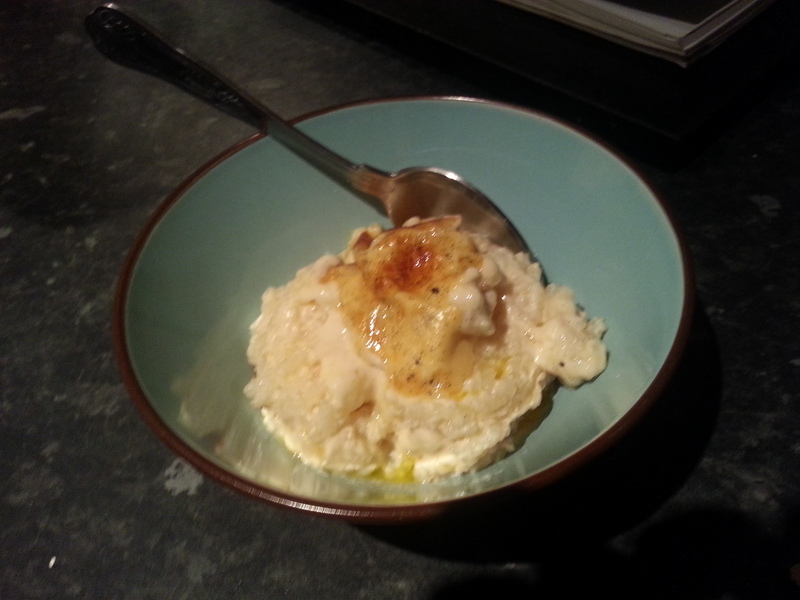 Anyways, enough waffle, here is my recipe for rice pudding. It takes long and slow cooking, but these things are worth the wait. I use vanilla as my spice, but you could use cinnamon, nutmeg or allspice. Currants or sultanas make a good addition too. The most important thing is to buy proper pudding rice – a short, fat grain similar to Arborio rice. If you can’t get hold of it, I’m sure any other glutinous rice will do, but don’t quote me on that! Grease an ovenproof dish with a capacity of a little over 1 litre with butter and scatter in the pudding rice, followed by the sugar. Break up the remainder of the butter into little knobs and dot them about. Deal with the vanilla pod: using a small pointed knife, carefully cut the pod lengthways so that you can scrape out the seeds. Put seed and pod in amongst the rice. Pour on the milk and pop into an oven preheated to 140⁰C for around 2 hours, but it may be more. Every half an hour give the pudding a good stir so that the rice grains don’t clump together. Don’t mix it in the final 45 minutes or so if you want to achieve a good crust. Make sure everyone gets some skin and a good blob of jam. I would go strawberry or raspberry here, but it is entirely up to you. There’s a shop in Manchester called On The Eighth Day that sells a great organic pudding rice. I’m sure you can buy it online. Lidl will be great too I’m sure though! Do you have a recipe for bread pudding? Do you mean bread and butter pudding (bread and raisins cooked in a custard) or a bread pudding where bread is soaked in water and squeezed dry, then mixed with suet and dried fruit…? It’s a YES to the former and a NO to the latter! I’ll add my recipe soon if you want it….